!mindparade was initially the bedroom project of Bloomington, Indiana-based Alex Arnold, who wrote his songs with the intention to form a full band when the opportunity arose. 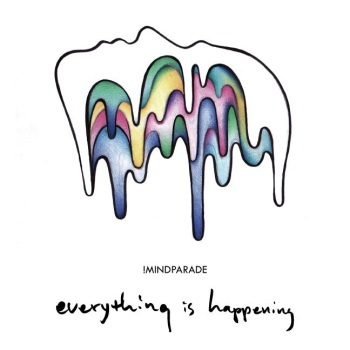 Now an eclectic eight-piece specializing in everything from synths to bass, !mindparade has turned Arnold’s sketches into a wonderfully creative psych-rock album, Everything Is Happening. !mindparade’s ability is on full display with “Gravitation”, a track incredibly easy to get lost in. At the end of each verse, when Arnold’s voice resembles a tranquil hush, flurries of warm synths invade the entire mix and add considerably to the stunning atmosphere. The chorus reveals itself as a rocker of the ’90s alt-rock variety, a surprising though wholly effective transition from the lovely psych-rock initially portrayed. It’s one example of Arnold’s enjoyably eclectic songwriting. Though “Gravitation” is my personal favorite for its sheer atmosphere, Everything Is Happening has plenty of interesting tracks. “Arrange Blood” is heavy on the brass; spontaneous bursts begin to resemble a marching orchestra. The swelling chorus reaches a grandiose sound that resembles Florence & the Machine’s most psychedelic instrumentation. It’s a surprisingly arena-ready sound for a group that uses many lovable DIY tendencies. Another highlight, “Gonna Be“, features a tight rhythmic sound inspired by post-punk, and the experimental avant-garde fusions of Can. Post-punk conciseness evolves into a distortion-friendly vein of rock ‘n’ roll that hearkens back to T. Rex and Bowie. It’s another piece of nostalgic goodness, yet led by a contemporary edge. I love “OK” as well, which mixes a tropical acoustic lull with ascending violins. The woodwind-accompanied second half is what dreams are made out of. !mindparade reminds me of some favorite finds — Fly Golden Eagle and Quichenight, two other groups who were able to masterfully juggle nostalgia with innovation.